Hyracotherium was very small (small-dog size) and had four toes on its front legs. Although this genus gave rise to various lineages of horses that included successively larger and faster horses, Hyracotherium was not a runner. Instead, it moved slowly about in forests and relied on its own camouflage rather than swift running in order to protect itself from predators. Hyracotherium (length 60 cm = 23 inches). Hyracotherium was the first name given to this genus, based on specimens found in England. Later, based on specimens found in North America, it was mistakenly named again; this time as “Eohippus,” which means “dawn horse.” Eohippus is thus a secondary junior synonym of Hyracotherium, and in the international rules of naming of organisms, Hyracotherium has priority because it was named first. 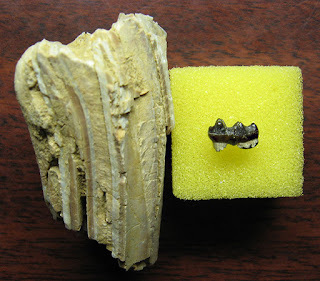 The tooth shown below is a single molar from the lower jaw of Hyracotherium angustidens of Eocene age from Wyoming. Its teeth were low-crowned with low cusps, which enabled the animal to eat both fruit and soft leaves. Side view of a molar of Hyracotherium angustidens; specimen is 10 mm length, 5.5 mm height. Top view of molar shown above. The next picture shows how small an H. angustidens molar tooth is in comparison to a molar tooth of the modern horse Equus caballus. Side view of a molar (50 mm height = about 80% complete because the base is broken off) of Equus caballus versus the molar of H. angustidens shown above.